Rapper Meek Mill arrives at the Criminal Justice Center in Philadelphia, Monday, Nov. 6, 2017. 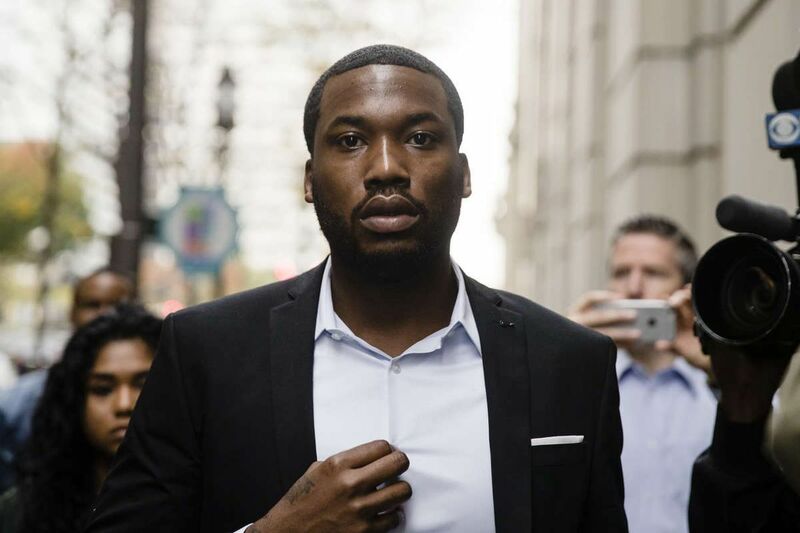 The Philadelphia judge who has been the target of wrath by high-profile backers and fans of rapper Meek Mill is standing her ground, saying she "committed no error." She also again denied a defense request for bail. Common Pleas Court Judge Genece E. Brinkley, in a 48-page opinion filed Thursday, wrote that she had not erred by not recusing herself in Mill's case. She also said she had found sufficient evidence that he had violated his probation and that the prison sentence of two to four years that she imposed on him "was not manifestly excessive." Brinkley's opinion followed Mill's various motions for her recusal and his appeal of her sentence to Superior Court. On Nov. 6, she found that he again had violated his probation stemming from a 2007 drug-and-gun arrest. She ordered Mill — born in Philadelphia as Robert Rihmeek Williams — taken into custody to serve his prison sentence. In Thursday's opinion, the judge, in her first official statements addressing defense calls for her recusal, said the claims were meritless. Joe Tacopina, a Mill lawyer based in New York, contended in November that the judge had asked Mill in a private February 2016 meeting to record a version of a Boyz II Men ballad called "On Bended Knee" and give a "shout-out" to the judge. In her ruling, Brinkley called the assertion a "bald allegation" with "no basis in reality." "There is zero evidence to support this claim," the judge wrote. "There is no record of such a conversation ever taking place and thus no evidence to support this claim." Addressing another claim that she had offered Mill "inappropriate personal and professional advice," urging him to change management companies, Brinkley wrote that she "has no personal interest in any of [Mill]'s professional and business matters." "The court has repeatedly told defendant that he cannot demand special treatment just because he has chosen to be an entertainer," she wrote. Mill's attorneys, in a Dec. 4 motion, also claimed that Brinkley herself was under an FBI investigation. "To the contrary, there is no evidence to support any of these claims," Brinkley wrote in her opinion. "There is zero evidence that there was ever any FBI investigation. This court was never directly informed of any past or ongoing investigation by the FBI. This entirely self-serving and baseless allegation apparently was fabricated either by defendant himself and/or others." Federal law enforcement sources have confirmed that there is no active probe into Brinkley's handling of Mill's case. It was Mill himself who in 2016 pressed the FBI to investigate the judge, who had repeatedly concluded that he had violated the terms of his probation, sources have said. And it was Mill who brought the short-lived review to a halt by ending his cooperation. Mill, 30, is incarcerated at the State Correctional Institution in Chester. At his August 2008 trial, in which Brinkley convicted Mill of gun and drug offenses, Mill had testified to being in possession of a loaded gun and carrying it concealed without a license, Brinkley wrote. She sentenced him in January 2009 to 11½ to 23 months in county jail plus 10 years of reporting probation. Then-Philadelphia Police Officer Reginald Graham testified against Mill at his trial. Graham, whose credibility has recently come under question, said Mill had pointed a gun at him, then tried to run from police. Mill acknowledged that he had a gun but insisted that he never pointed it at police. At the Nov. 6 hearing, Mill "admitted that he was a gun carrying drug dealer," the judge wrote. She also noted that Mill had said at the November hearing: " 'Even when two officers came in here and said that I pointed a firearm at them, your judgment was, you found me guilty of pointing a firearm at these two officers, which you should.' "
The prison sentence "was absolutely necessary to vindicate the authority of the Court," she wrote. While on probation, Mill "repeatedly demonstrated his disdain for this Court's rules and the conditions placed upon him. … Each time, Defendant thumbed his nose at this Court and refused to take his sentence seriously, ostensibly due to his status in the entertainment business." She wrote that she had revoked Mill's probation in November after he had, among other things, tested positive for opiate use and incurred two new arrests — in St. Louis and New York. Tacopina, in an emailed statement Monday, continued to assert that Brinkley has a "personal vendetta" against Mill. "In spite of the recommendations from the Philadelphia District Attorney's Office, which was supported by Governor Tom Wolf, the judge continues to stand alone in supporting Officer Reginald Graham's perjured testimony as well as his criminal behavior that has been documented. Fortunately, we have already filed petitions with the Pennsylvania Supreme Court to secure his release and we remain hopeful that the court will right this injustice very soon." Two Philadelphia-based lawyers for Mill, Brian McMonagle and Alexis Cocco, could not be reached for comment. Brinkley has scheduled an April 16 status hearing in Mill's case on a defense motion to overturn his conviction based on the allegations against Graham. Staff writer Jeremy Roebuck contributed to this article.